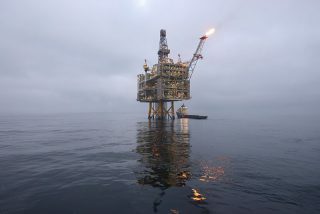 About 95 metric tons of oil leaked into the North Sea on Sunday from BP's Clair platform, and it will be left in the ocean. BP says the oil is moving away from land and dispersing naturally, but the spill is a reminder that accidents happen as more oil development is eyed for the Arctic. Story here. The Clair platform. BP photo. A Technical Issue…No plans to clean up….Shame on them.! This spill reported as 95 metric tons calculates to about 108,000 litres / 23,800 Imperial gallons. Once again, Mother Earth's lifeblood spills as she slowly loses her life & death struggle with Big Oil. What in hell is so natural about the sea waters dispersing oil…..and they call it naturally. Who writes that kind of garbage? This is /was not a natural event …it was a human involvement that polluted the waters.